Here is the transcript of yesterday's Urban Meyer Sugar Bowl press conference as published by ASAP Sports. The press conference may be viewed on GatorVision.tv via the Florida Gators web site. Image Courtesy University of Florida Sports Information Department. COACH URBAN MEYER: First of all, it's great to represent the Southeastern Conference at the Allstate Sugar Bowl, the first time I've had an opportunity to be at this Bowl game. I know the players are excited, and we play a great team in the University of Cincinnati, so we're excited to be here, had a very spirited practice today and Gators are going to play well. During this past week, as we discussed, a decision came to -- I was offered and encouraged to consider taking a leave of absence. After careful consideration and spending time this morning at practice with my players and coaches that I care so deeply about, care so much about, I've accepted this offer to improve my health. We have developed a program we are very proud of at the University of Florida. I owe it to our players and our staff and my family and the University of Florida to get healthy and coach. In the meantime Steve Addazio will serve as interim coach. I believe he's one of the top coaches in America. He's also been on our staff for the past five years. I'm grateful for the continued support of Dr. Machen and Jeremy Foley, and I'm blessed to be surrounded with a great group of players, a great group of coaches, and I'll always be a Gator and represent the Gators well. It's great to be here once again on behalf of our football team and represent the great University of Florida in this BCS Sugar Bowl. That said, I'll take questions. Q. Would you talk about the last 24 hours, what went into the process and how you finally came to the conclusion to take the leave of absence? COACH URBAN MEYER: Yeah, I think it's very simple. The love that I have for these players, I think that's well documented. Maybe one of the issues that I deal with is that I care so deeply about each individual. When I saw them come out there today after our meeting we had last night, it was a very -- it was an offer that I was encouraged by the people that I'm closest with, my family members, my close friend Jeremy Foley and others, to just step back for a minute. We've had a heck of a run, a run that we're very proud of, and when I sat back and watched those young guys go at it today and our coaching staff and the program we've built, to not try would be not the right thing to do. Q. Can you talk about your role in the Sugar Bowl this week? How involved are you in it? Is this Steve's show? Are you going to be the head coach of this game or is he going to be? COACH URBAN MEYER: No, full speed ahead. We have a great group of seniors that have set unprecedented records the last four years, what they've accomplished. We've recruited each one of these young guys, and it's full speed ahead, and we're going to do we possibly can do to win this game. Q. For Jeremy, the situation you have is unusual. I don't know if we've ever seen this in college football where you have a coach in waiting who's still a coach. What makes you -- can you talk about why you think it'll work? JEREMY FOLEY: Well, I think it goes back to what Coach just said; not to give it a shot wouldn't be fair to the University, wouldn't be fair to Coach Meyer, his family, to our players, to the program that we've built here, and "we" means everybody I just named. Obviously our primary concern here is Coach Meyer and his health and getting himself fixed. He's going to have that opportunity to do that, and certainly we hope that when it's all said and done, we're full speed ahead. But I think it's the right thing to do. There's no question it's the right thing to do for the institution, and obviously it's the right thing to do for Coach Meyer. Q. If you could, if there was any one thing that changed your mind from last night when it sounded like you were flat-out resigning to today, and also, Jeremy, if you had any discussions with him during that time that may have swayed things. COACH URBAN MEYER: Yes, it was our players. Once again, I made a comment about how proud I am of this football team, the way we go about our business. To see that come out this morning, for -- I guess I'm a southerner now -- for us southerners it was kind of cold, and to see them come out with a great attitude and great work ethic and just go to work, I admire that. I know I'm dealing with some stuff, and my family comes first. That's never been an issue. That's non-negotiable, that I want to make sure I do right by my family. My second family are my players and our staff, and to see -- that was the moment. I went immediately to Jeremy, and we had some discussions after that. JEREMY FOLEY: He called me from the practice field, and he didn't come to that decision right then, but he was just, I guess, a little stunned may be the right word. The way our coaches and our players went out -- last night was a tough night. People's worlds got turned upside down. The program he has built and his coaches have built, to come out today, and they practiced so well and so hard. He picked up the phone and called me, and he and I got together this morning, and coming out what Urban told them is that there's a lot of people, the last week or ten days -- and obviously working with Urban, concerned about Urban, want nothing but the best for Urban. We've all tried to get him to the point he's at today, and I think ultimately his players got him to that point. I think that says a lot about his relationship with his players, and it also says a lot about the players on our team. Q. Can you till us exactly what it is that needs to get fixed, when you talk about getting yourself fixed? And was it a condition that the doctors told you if you didn't address now would either be life-threatening or cause you serious harm? COACH URBAN MEYER: It's something that started about four years ago. It was chest pains that became rather significant two years ago. Whether it's stress related, I was very concerned. I know there's a great basketball coach that lost his life at Wake Forest. I started to become very alarmed with that. And then I'm a person of faith, and I just wanted to make sure I had my priorities straight. A lot of times coaches do not have their priorities straight. You put business before God and family, you have a problem. So when we had the issue when I had to go to the hospital and a couple issues after that was when I came to the conclusion that I had to re-prioritize everything. So that's exactly what it is. I was advised that I have to get this right or it could lead to damage. That's what made that decision. Q. You had several additional episodes of chest pain after the SEC title game? COACH URBAN MEYER: It's been all year, yeah. All year. Q. Did you have to go to the hospital for any of those other ones? COACH URBAN MEYER: No. Got it checked out, though. Q. Have you talked to Billy at all? Obviously he had a change of heart a couple years ago, and he decided he was going to stay at Florida. Did you talk to him at all about your decision? COACH URBAN MEYER: No, I haven't. I haven't had time. This has all gone on so fast. Billy is one of my closest friends, and Florida is a great place. Florida is hard to -- if you guys are fortunate enough to be out on the practice field -- and Florida is not just a great place, Florida is a great place because of the people. It's because of my boss, it's because of the players and the way we do things. I'm sure Billy feels the same way, and we've kind of created a monster at Florida where we've had some great success, and Florida deserves that, and you just feel an enormous amount of -- I don't want to say pressure, but I want to do right by your players. You want to do right by that school. They deserve right. Q. Last night you talked a little bit about how your problems were stress-related and it was cumulative; it was the way you went at things and such. How can you come back and not do things the way you do them? In other words, how can you cure what you said was basically self-inflicted? COACH URBAN MEYER: That's something I've got to figure out. There's obviously other coaches that have great careers and have done great things for a long time. You hit it on the head. I'm going to get that fixed, and I'm going to attempt to get that thing fixed. Q. A quick follow-up, and I actually have your family about three feet from me. How did they react? You obviously were pretty emotional last night when you talked about your daughter's reaction, saying she had her daddy back. How did they react to this in the last 24 hours? COACH URBAN MEYER: Well, they just found out recently as we stepped on the plane. I grabbed them -- and we're an extremely close family. When I say extremely, extremely close family. That's the most important people, the most important aspect of my life. To put them in jeopardy, I won't do that. So I think they'll know before I do anything that I'll feel good about doing it. Q. When you said leave of absence, are you just going to maybe retreat somewhere for months and just relax, or are you actually going to be around? Do you know how you might want to tackle that? COACH URBAN MEYER: I'm not a person to go lay around, so no, that's not the answer. I'm going to go -- I don't know that. If I did, I'd tell you. I want what's best for Florida. I want what's best for my family and then coach this game, get some stuff figured out, and keep this program -- keep the freight train going in the right direction. Q. Are there any procedures that you're going to undergo in the next coming months that will help the condition? COACH URBAN MEYER: I'm not sure. That's something that we'll find out, as well. Q. And who's going to be in charge of hiring a defensive coordinator? COACH URBAN MEYER: That's something that we're going to discuss, because this all happened so fast, in the next couple days. Q. For Tim and Ryan, can you guys just talk about what the last 24 hours have been like for the team and the emotions you guys and the other teammates have been through, and in terms of Jeremy, did you do anything trying to move forward before Urban came back and told you what he told you today? JEREMY FOLEY: We started some preliminary work, but certainly a lot has happened in the last 24 hours. We've had a number of conversations with Urban the past week, and I knew where his head was at. But we hadn't done a whole lot. There wasn't much time to do that. We were just beginning the process. TIM TEBOW: The last 24 hours have definitely been a whirlwind in dealing with everything and just knowing that Coach Meyer was going through just hard times with his health, and just trying to deal with that was obviously hard on me and a lot of players. Talking to him before practice yesterday was really tough because I didn't know what was going to happen, but I knew just by talking to him that everything wasn't right just because we're so close, and I knew that something wasn't right, that something was going to happen. Then after practice we had a team meeting, and he told us. A lot of the guys on the team were crying and upset, but for the most part, I think everybody wanted what was best for Coach Meyer. You know, we look at our team as like a family, and we just wanted what was best for our dad, and that's Coach Meyer, and we want him to do what's best for him. We want him to get himself right, and when he's right, then come back to coaching, then get back into ball. But I'm so proud of him because of the decision that he's chosen to made. I don't think most coaches would have the guts to make it, to give up everything for his family and his faith and to get himself right. I admire that about him and I admire him for the decisions that he's made. As a team we support him. As Gator Nation I think we support him, and I think he's making the best decision for him and his family, and I'm extremely proud of him for it. RYAN STAMPER: Just like Tim said, the last 24 hours have definitely been a whirlwind for the team and a lot of the coaches and players. But just over my five years here, me and Coach Meyer have become very close. He's like a great friend to me, and I take him hat off to him. He comes first. If you're as close as we are, you pretty much know -- don't really look at the other things like the coaches and the things like coach coming in. He's got to pretty much worry about himself right now. Just as close as we are, that's what was first on my mind when he told us about his decision. Q. Coach, you talked a lot about having gut feelings about things. In your gut do you think you're going to be the coach of this football team come fall? COACH URBAN MEYER: I probably knew that question was coming. I do in my gut believe that will happen. Q. But no timetable in your head? COACH URBAN MEYER: We're going to discuss all that after. I think the important thing was to get this thing going, and let's go have a great Bowl game. For gosh sakes, we're 12 and 1, and whatever the record is the last two, three years. These darn guys next to me -- I mentioned my family. These guys are next to family. So I'm trying -- let's get off of me. Let's go play this game; let's go have fun. Let's enjoy our time here in a great city and go play. Then after that we'll have discussions about that because I don't know, and I'm not going to give it any thought because we've got a game to go. Q. Hypothetically could it be awkward, messy if you were to not come back and just have the "limboness" of recruits and players and coaches? COACH URBAN MEYER: We'll answer those questions. I think Florida is such a strong place, and I think the intention is there. I think it will happen. Like I said, all that is going to happen immediately after January 1st. Our focus for these next four days, we're playing a heck of a team now. And to not -- we have a saying around our facility and our team, "it's what we do," and what we do is we prepare real hard, we focus real hard, and we go play real hard. For any distraction, that's why after this, it's done, it's over, we're going to go win this game or attempt to win this game, and then put everything in motion that we have to. I have so much confidence in the University of Florida and such great love for the University of Florida and our staff that this will all be great. JEREMY FOLEY: If I could jump in, I just want to follow up. The intent here is to make sure that Urban goes and deals with the issues that he discussed last night. Those issues still remain. Those are very significant concerns for the University of Florida and for those of us who love Urban Meyer. And so getting into when are you going to come back or this game or that game, this is a long-term conversation. Ultimately Coach Meyer needs to be the Coach Meyer that we all know, and he's comfortable with that and his family and his life. That's it. We're going to help him deal with that. That's why we're sitting here today, because we want to help him deal with that. We're very confident, as Coach just said, we can keep this thing going in the right direction. We just want to make sure we understand that, that every week we're calling, where's Urban. When it's time, it'll be time. Q. Coach, starting to get specific, are the chest pains because of an irregular heart valve, something along those lines? COACH URBAN MEYER: I don't want to get into all that. COACH URBAN MEYER: Tom, you ask great questions. The low point was when on Christmas night with my family there was so much concern and love in that family on obviously a very special holiday, and I could see the concern in my family. And then the low point was meeting with the team last night. The low point for Shelley, you'll have to ask Shelley; I can't speak to that. She's my best friend, she's my soulmate. We got into coaching, and not to give you my life story, but we got into coaching knowing this was not going to be the tempo and -- that's why I have such admiration for the Coach Bowdens and Coach Paternos of this world. Wow, when you put your heart, soul and everything into being a father, husband and coach, not much time left. Got to make sure we stay in that order, father, husband and coach, and not flip it. Q. What do you remember most about what Coach said? RYAN STAMPER: I'd say what I remember most about a day ago is when we were just on the football field seven on seven, and I could just see in Coach Meyer's face that something was wrong. I didn't know exactly what was going on, but I could just see it. I was like, "what's up, Coach, are you all right?" He said, "Yeah, I'm all right." He told me he loved me, and I told him I loved him back. When he did that, man, I just kind of felt really good for Coach telling me that, and he told me that in front of all the players that were there. It just felt real great at that moment. And today just the intensity that we came out with in practice, even at a down moment, but the guys still came out there knowing that we have a job to do and we have to finish the job, and just like Coach Meyer said, the way practice was today and the way the coaches got after it, the way Coach Meyer got after Tebow, everyone, just showed the type of program the University of Florida is after a situation like this. TIM TEBOW: For me, a similar experience, too. Yesterday in practice, I just got done running like a quarterback draw and I was finishing starting a turn, and usually messing with Coach Meyer like I usually do, and he just looked at me and said the same thing he said to Ryan, just "I love you." Then I knew that something was up, that something wasn't exactly right there. Not because he said that, because we say that to each other, but because of the moment and everything. So I knew something was going to happen. That's just Coach Meyer. In his speech and just talking to me one-on-one on the side last night, he wanted to make sure that with this decision everybody else was taken care of, even when he's trying to do something for his family and for himself, he still wants to make sure the players are taken care of and the coaches got a spot; everything is good with the coaches and everything is good with the players. That's what I remember most is when he's got all these big decisions for himself and for his health, all the huge critical decisions he's got to make, he's still worried about everyone else. That shows how much he cares about this University, his players and then his coaching staff. And then this morning just seeing when we got to the practice field and he sees his team play and he talks to his team, he lights up. Because he's around guys that he loves and he's around Coach Mick and he's around Coach Gonzales and all the coaches and his players, and he loves those players, and you can see there's a little bit more joy in him this morning. And then when he told us that he was coming back, you could see a little bit more joy came into his eyes and came to his face, and it just got brighter, and that's what I remember most. When he's around the people he loves and he's talking about his family, he lights up, and that's what was very special about today. Q. Jeremy, when you went to bed last night, if you did go to bed last night, did you have any idea that this was possible, that there could be a change of heart? JEREMY FOLEY: No, two sleeping pills didn't even help last night. It was a long night. It was a long night for everybody in the Gator Nation I'm sure. When Urban called me from the practice field this morning, we didn't talk about this. I could just sense the pride he had, and I think people don't understand, it's not a bunch of kids that just came out of there practicing hard. It's because here's a program that had its life turned upside down and instead of people worrying about themselves, which is normal, and kids worrying about being down and coaches worrying about what they're going to do next, they went out there and they practiced because they're professionals and they're pros and they care about the University of Florida, and that's what our program is about. That's what Urban told me from the practice field today. So when I first heard that from him, I heard a spark, hadn't seen one in a while, and then he called me a little later on and we got together in the office and spent some time together, and here we are. Q. Tim, as close as you are to Urban, how aware were you of the previous health issue that he said he had starting four years ago, and especially recently? TIM TEBOW: Well, I wasn't aware that it had become as bad as they had. I was aware that he had some issues. I was aware that it bothered him some, just because he would tell me when we would be talking in his office and stuff. But I didn't realize that it had become so bad, and just hearing that news and seeing his face and just seeing everything he was going through was very hurtful for me, just watching him and seeing him struggle and seeing him go through the illnesses, getting back from the hospital and hearing everything that was going on with him. It kind of just hit me like a ton of bricks that it was this bad. It wasn't just some -- he had something wrong and had digestive problems, no. He was dealing with some issues and his family was dealing with it, and it was very hard for me to hear because seeing someone you love go through something so hard was really tough. Q. I just wanted to make sure I got this right in my head. Did the doctors ever specifically advise you that you need to step away from coaching? COACH URBAN MEYER: I'd rather not get into that. Q. There are reports that you had a heart attack. Did that ever happen? Q. Also, the leave of absence option, that was on the table from the beginning and you decided not to take it originally? COACH URBAN MEYER: That's correct. It was -- our president was the first person that brought it up, and I understand it's happened before I think in college basketball. I didn't know that. University of Florida is so different; the relationship that we have with our president is unbelievable. The relationship obviously I have with Jeremy, this is not a -- it's a very open -- we talk about everything. And some people that are very close to me advised me, just step away for a little bit. They could see the distress that was going on, step away for a moment. So the option was there from day one. Q. Would you talk about the emotion when you first told Jeremy that you had made the decision, and then the emotion again when you told him, okay, I'm coming back, but we're going to do it this way? COACH URBAN MEYER: Well, completely different emotion. The original emotion was, once again, I just wanted to make sure we put our heart and soul into this program, and I went to the best athletic director in America to make sure this thing keeps rolling, so how can I assist. I don't want to -- this is not to go get another job, this is not to go -- this is just an opportunity to make sure that I don't do something that would damage my family. So that was perfectly clear. What's next, and I wanted to help, and be a part of the process to help. The second part today, when I called him and had a little pulse down there, and I looked at the -- we actually practiced in the Swamp, and was just staring at the National Championship, was just staring at the different things in that great stadium, that's when I called him, and I watched our guys work. I think what happens is I think head coaches get far too much credit. Programs are programs; that's why you see -- I go back to like the Colts. The Colts obviously have a heck of a program. I don't know their record right now; I think they're doing very well. But Coach Dungy built a program. There's other great examples of programs that if you follow -- Kyle Whittingham has done a great job at the University of Utah because he built a program, and it's a program built on rock, it's not on sand. That's what I made clear to Jeremy when I was out there today; this program isn't because of Coach Meyer. He's got actually very little to do with it. It's because of the staff, support staff, most importantly the great players we brought in here. That's what's happened, and we just need to continue that. Q. First of all, with whatever is wrong with you, is it because of who you are or because of what you do as a football coach? Q. Could you expound on that one a little bit? Obviously you're an intense guy, it's an intense job. Is that just a bad mix that grinds on a guy? COACH URBAN MEYER: Yes. I just think that -- I have some great friends in this profession. I don't think the appropriate words are take it personal, but when we lose a game, it's well-known. People who have known me know that it's my fault, and we've got to get that fixed. If that means staying until 4:00 in the morning, if that means rehashing over and over again what to do different, it's our fault. When a young man flunks a class, that's our fault. Something happened. I think what I have to learn is you can't just accept -- you've got to be able to delegate might be the right word, that you have to delegate and you have to function. I've lived a nine-year coaching career -- I'd say a 30-year coaching career in nine years, and I can't do that. I just have to be smarter. I'm not very smart; that's part of the problem. Q. Can you just talk about the sheer emotion of walking away from a school that's driven you, and then the emotion when you decided to let the door be cracked for a return? COACH URBAN MEYER: A very emotional day, not knowing that crack is still there. I don't know that door is still there. 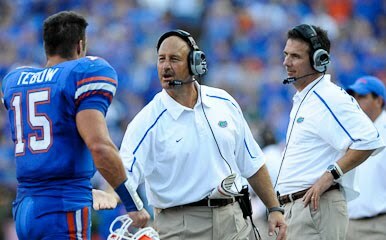 But what I didn't want to have happen, and I made this clear to Jeremy, if I am able to go coach, I want to coach at one place, the University of Florida. It would be a travesty, it would be ridiculous to all of a sudden come back and get the feeling back, get the health back, feel good again and then all of a sudden go throw some other colors on my shirt and go coach. I don't want to do that. I have too much love for this University and these players and for what we've built. Q. Jeremy, what are the terms, I guess, of this new deal? Is Urban going to be paid as head coach? JEREMY FOLEY: He's the head coach at the University of Florida, and obviously those details as far as Coach Addazio and those types of things are to be worked out. But the head football coach at the University of Florida is taking a leave of absence, and that's what it is, and that's what it will be, as I said, until he comes back and tells us this is what he wants to do. Q. Before this morning's change of heart, was there going to be a buyout? COACH URBAN MEYER (SIC - Should read JEREMY FOLEY): The last ten days, I couldn't tell you if there's an buyout in Urban's contract. As he said in this press conference, he's given every fiber of his body to this program. My office is right next to him every day, so I've seen it, and I kind of understand why we're sitting here today and talking about some of the things we're talking about because I've seen it every single day. So if there was a buyout, I assure you it wouldn't have been exercised because we can never repay him for what he's meant to the University of Florida and what he's accomplished and what he's given personally. There would not have been a buyout in this situation. Q. I apologize, I never had chest pains and I don't have three children, but can you give me an idea of what it feels like, just the scare factor of that combination? COACH URBAN MEYER: Yeah, I mean, I have to be careful here, but -- you said you don't have three children? All due respect, it's hard to understand. That's always been our first priority, and I want to make sure that's always going to be our first priority, especially the age that they are. That's obviously -- that brought this all on. Tim knows that, Ryan knows that. Everybody on our team knows that. We have Thursday family days, and our players' families are welcome to everything. There's been -- players have had family situations on our team, and we drop what we're doing immediately and go help that family and do what you have to do. That's non-negotiable; you take care of your family. I had a coach come down with a serious illness. Immediately -- he's worried about recruiting, he's worried about this. The first page of our manual says, "Take care of your health, take care of your family." It's not just a discussion, that's a rule. So that came to my end, and I was very concerned. Q. Anything you can compare it to, the scariest moment in your life? COACH URBAN MEYER: I don't know if it was scary, just alarming. I don't like to use the word scary, but it was just alarming. I have an obligation. At the end of the day you're going to be judged on what kind of husband and father you are. That's real important. Q. Jeremy, you just said that your office is next to his and you have an understanding as to why we're here today. What gave you that understanding, and what was your fear? JEREMY FOLEY: Well, for five years, I've said it a thousand times, the relentless efforts. Every single facet of this program, every detail, every player issue, staff issue, game planning, just unbelievable amount of preparation, recruiting. It never ceases. Urban Meyer and the University of Florida has been successful here the last five years because of the type of effort he puts in, his players put in, his coaches put in. He and I have had a number of conversations, not about sitting here today talking about these issues, but is Urban Meyer going to be coaching football when he's 60 and doing it the way he's doing it now? No. I knew that, and I knew that when he signed a new contract. If the University of Florida got the entire contract out of him, we'd be blessed. Again, you just see it. A guy can't keep up that pace. So what you're concerned about is that -- you're concerned he'll one day walk in and say he's leaving, but obviously you get concerned about his health because Urban is a friend, a dear friend, and taking care of himself hasn't always been the highest on his list. I've seen lunches on his desk go uneaten. I know it's evident he's dropped a bunch of weight. So you get concerned about those things. But again, like I said, I've seen it every single day for five years. JEREMY FOLEY: Gary talked about is it because of who you are and what you do, but Urban is again, very, very successful because of how he has done things. So a part of this process here is he's going to have to evaluate how he's going to do things. I think he said that earlier himself. What does that mean? We don't know. Are we going to be here to help him? You're darned right we are. But that's the challenge, because the only answer is to come back at some point and coach, and then he's back here again physically and mentally and with his family, whatever, what have you. So the challenge here for him and I'm sure for Shelley and all of us who care so much about him is to help him evaluate how he does things but not take away the edge that makes him successful. It's a challenge. Q. I saw that you've lost about 20 pounds. Do you plan to eat well while you're in New Orleans? And secondly, a lot of teams let the players come on their own and so forth. You were there with your team yesterday and today. If you had let the players come on their own, do you think this might have played out differently? COACH URBAN MEYER: First question is I love the New Orleans food. I hope I dig into it pretty good. I hope that happens. Second part, I didn't even think about that. I just think we kind of have a tradition about traveling together, and I wanted to fly together as a team, because I wanted to bring them back after Christmas and get a couple practices in at home before we got here. Q. What was it like for you last week flying to California and South Florida with all this stuff looming over your head, and are you off the recruiting trail now and are you done until signing day or whatever? COACH URBAN MEYER: No, and it's dead period right now, so there's no recruiting going on. And then in the middle, my left-handed quarterback had a Heisman ceremony we had to go to, too, so we did a lot of stuff together, a lot of flying, a lot of traveling. That was during this time this was going on. So that was a tough time. COACH URBAN MEYER: I might call Coach Spurrier because we have a very good relationship. As a matter of fact, I'm going to call him because I admire the way he's done things, and he's done it for a long time.